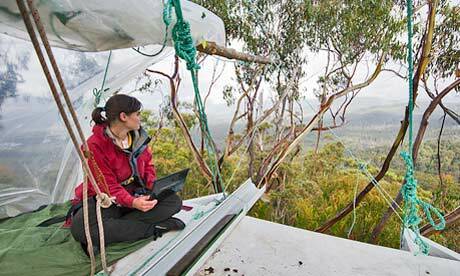 For the past year, Miranda Gibson has lived on a small platform that is suspended 60 metres above the floor of an ancient forest in Tasmania’s south. “I climbed up this tree because I wanted to expose to the world the reality that logging was continuing in these forests despite promises by the government to the contrary. I wanted to do something that would show the world how significant these forests are,” says Miranda. This action is perhaps the most emphatic in a long and passionately fought battle, which has consistently divided Tasmania. Supporters of the timber industry are firmly entrenched on one side, with environmentalists on the other. There are few people in between. This feud, ongoing since woodchipping commenced in Tasmania in 1972, was set to end with the announcement of the Tasmanian forest agreement, struck between representatives of the timber industry and environmental non government organisations. After two years of bitterly-fought negotiations, a deal was finally forged between the two opposing parties. And just in time. Failure to complete these negotiations would have jeopardised $100 million in Federal money, to assist the restructuring of the ailing timber industry. The agreement, which is currently waiting approval from Tasmania’s Legislative Council, will see the immediate protection of 395,199 hectares of forest, with a further 108,813 hectares to be protected by 2015. A further 20,183 hectares have been earmarked as a “once-off log, restore and reserve area,” while 1,228 hectares are classified as a “log-of-last-resort” zone. According to the agreement, the cap on saw logs to be taken from native forest is down to 137,000 cubic metres annually, representing a drop from 348,000 cubic metres. The agreement promises to ensure the protection of iconic forests, such as the Styx Valley, Upper Florentine and Weld Valley. Signatories to the agreement include Terry Edwards of the Forest Industries Association of Tasmania, Vica Bayley of The Wilderness Society and Phill Pullinger of Environment Tasmania. The parties emerged triumphantly from the discussions, talking in terms that indicated the gravity of the discussions and their subsequent impact on the smallest Australian state. Terry Edwards spoke as a seasoned diplomat calling an end to a long and bloody confrontation, claiming that “We believe it is time for the war to cease…” Tasmanian Premier Lara Giddings channelled Benjamin Franklin, stating that “Out of adversity comes opportunity and what has been handed to us today is a momentous opportunity to heal decades of division.” Giddings described the agreement as an “historic moment – after 30 years of division, we have the opportunity to work together towards a common goal.” Tasmanian Greens Leader Nick McKim likened forest protestors to Rosa Parks, Mahatma Ghandi and Nelson Mandela, which prompted Liberal Opposition Leader Will Hodgman to label McKim as an environmental saboteur and then call for his resignation. Although an agreement has been struck between elements of the two opposing camps, clearly this will not result in the ending of hostility. However, Terry Edwards feels that it is the forest industry which has given the most ground in this instance. “The timber industry has moved significantly and effectively on this proposal, largely giving environmental groups what they have been asking for and in return that this does mean peace in our forests and that that peace be lasting,” Mr Edwards said. Edwards attempted to ward off potential criticism, stating that “Many will accuse us of selling out (but) we’ve done an assessment of what we can wear and still maintain a reasonable and viable industry going forward,” he said. With signatories to the forest agreement locked in discussions concerning the passage of the bill through Tasmania’s Legislative Council, Dr Brown states that Miranda’s tree sit is taking place at a time, “When so much oomph has been lost by environmental activism around the world.” Lamenting the decline in direct action of environmental activists globally, which he describes as “a serious loss to the environmental movement,” Dr Brown refers to the importance of conducting environmental action within the natural setting. “The strength of campaigning is being in a forest, on a sea shore, out at sea with the whales, up on the Murray Darling. The direct relationship with nature has always been a key in galvanising support,” says Dr Brown.